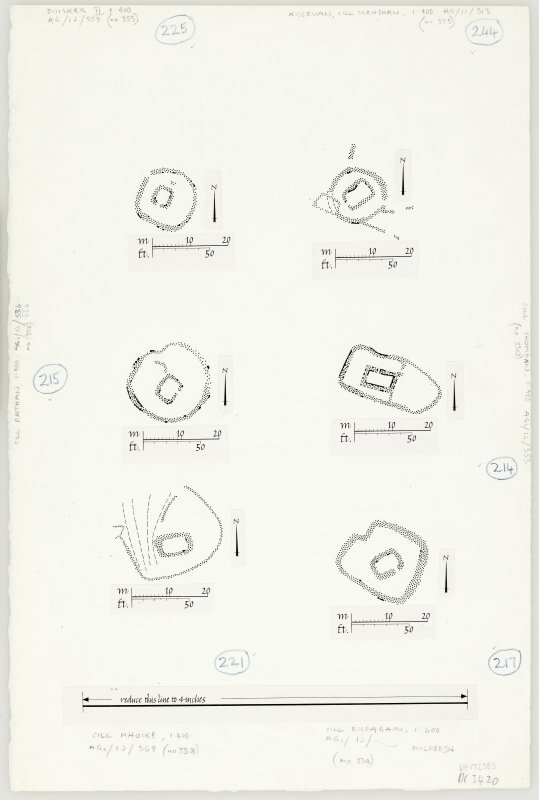 Survey plans of 6 chapels; Cill Mhoire; Cill Eileagain, Mulreesh; Cill Choman; Kilslevan, Cill Slebhan; Duisker; Cill Eathain. 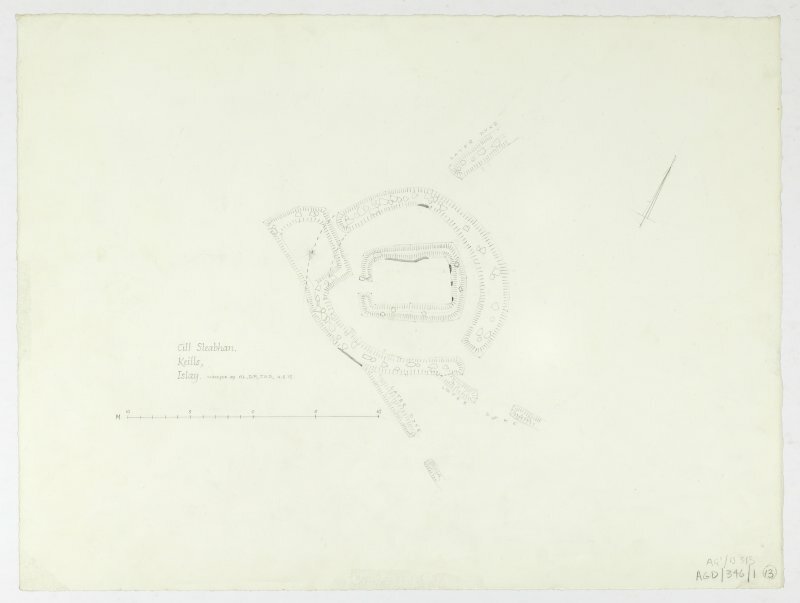 Survey drawing; plan of chapel and burial-ground. Pencil on paper. Cill Sleabhan: This name applies to an ancient burial ground, with the ruins of a chapel at its centre (ONB 1878). Name Book 1878; W D Lamont 1972. Watson, spelling the Gaelic name 'Cill Sleibheainn', states that it commemorates Slebhine, abbot of Hi, who died in 767.
lime mortar. A gap in the centre of the WSW wall indicates probable position of the entrance. subrectangular plan; this measures about 4-5 m from NW to SE by 3m transversely within walls 0.7m in thickness. There are no visible gravestones. A chapel and disused burial ground as described and planned. The north-west side of the burial ground is in the line of an old field bank. The chapel measures internally 6.2m ENE-WSW, by 3.5m; the wall, turf-covered, is about 1.0m thick and stands to 0.7m maximum. The burial ground, D-shaped but for the re-entrant angle in NW corner, measures 12.5 by 12.5m inside a turf- covered wall spread 2.5m broad and, 0.8m maximum height. Visited by OS (J M) 1 April 1979.